Could there be a bitcoin exchange traded fund (ETF) in the near future? The CBOE has refiled a rule change that would allow it to list Vaneck Solidex Bitcoin ETF product. The proposal was withdrawn from consideration early this month. The government shutdown was blamed for the withdrawal. Now that the government is back over the proposal has been resubmitted. The final decision date at that time was to be February 27. With the resubmission, the clock will begin to start again for a final decision by the SEC. Once the proposal is published (it apparently has not been done so yet), the SEC has 240 days to decide whether to approve or reject the proposal. The hope is that if there is a bitcoin ETF, it would regenerized the market. Bitcoin on Coinbase is trading down $20 at $3411.52. 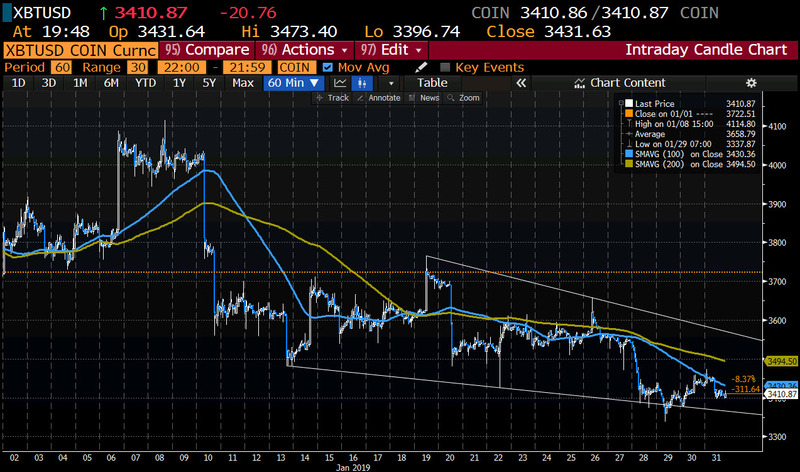 The price is trading below its 100 hour moving average of $3430.36 and 200 hour moving average of $3494.51. A move above each is needed to tilt the bias back to the bullish side for the digital currency.